Now walk up the church until you reach the sanctuary step. 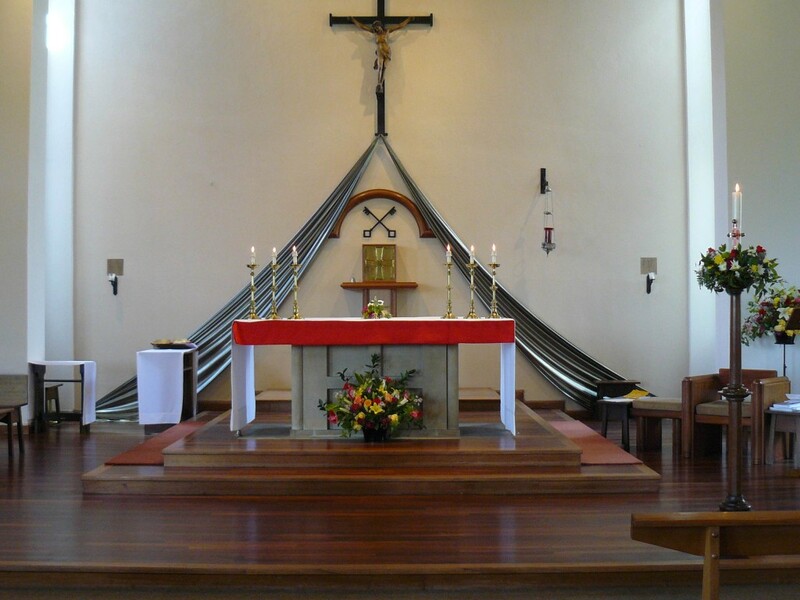 In front of you is the main altar where the priest takes bread and wine at Mass and with ceremonies and prayers calls upon God to make it for us the Body and Blood of Jesus. Jesus said “This is my body.. This is my blood.. Do this in memory of me.”, and so that is what we do. As with all altars, the candles are a sign that this is a holy place where God becomes present. 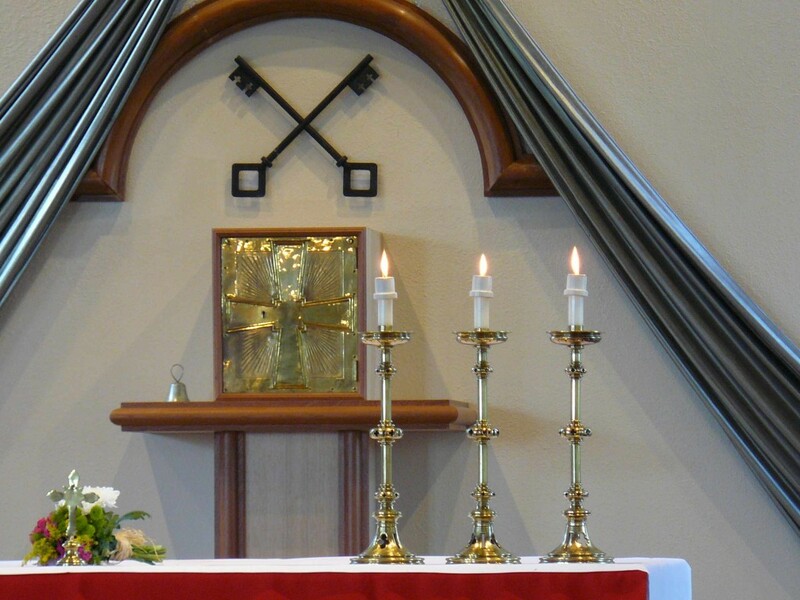 Look at the crucifix up on the wall behind the altar. It is a reminder that the God we meet here and proclaim to others is the God we meet in Jesus Christ who died on the cross thus defeating death to bring all who follow him to life with God for ever. Below the crucifix is a carving of the crossed keys of St Peter carved by Peter Nicholas whose grave you can find outside. Below that is a decorated cupboard called a tabernacle which is one of the most important things in a Catholic Church. Here is kept (reserved) some of the blessed Bread – the Body of Christ. This special presence of Christ is called the Blessed Sacrament, and this is taken regularly to those members of the church who are sick or housebound. A candle burns nearby as a sign that Jesus is present in this special way. The other important object here is the reading desk, called the Lectern, where passages from our holy book, the Bible, are read to the people. 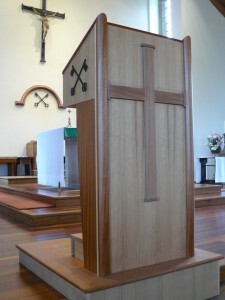 The new lectern in memory of Denis McCall, who was an active member of this Parish for many years, was blessed on Sunday 20th of February 2011. The Lectern has been donated by the McCall family. 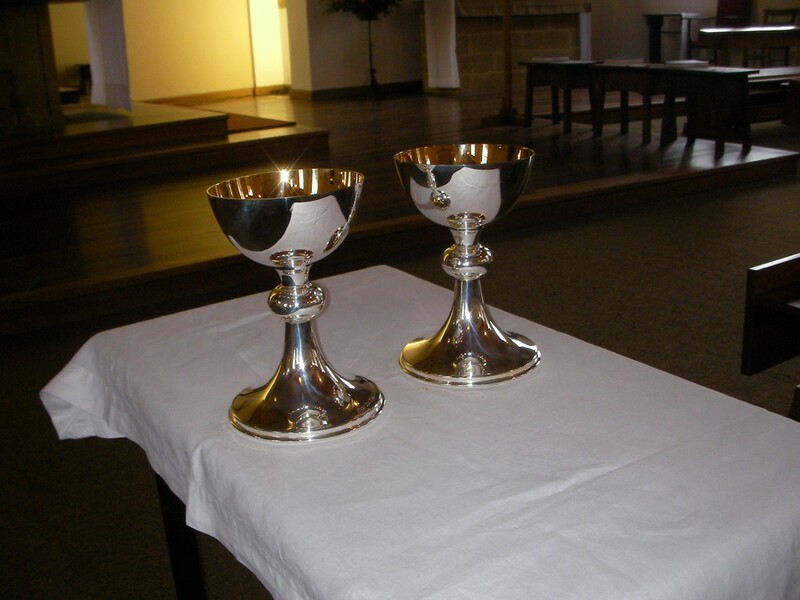 The new solid silver chalices, brought into Church in January 2011. These were generously donated by two people. Each chalice has the name of a friend inscribed on its base.